By having your children take packed lunches to school you will hopefully be able to monitor better what they are eating when they are away from you. You also know that they are not spending their lunch money on chocolate and burgers. But to make sure they still have a balanced diet, you will need to make sure you know hoe to create healthy lunchboxes – and moreover, healthy lunchboxes that they will actually want to eat, as this is the challenge with youngsters’ lunches. You may give them the healthiest lunchbox in the world and send them off, safe in the knowledge that they have no money to buy junk food. But if another child whose parents are not diligent takes a shine to your child’s lunchbox, then swapping starts to occur and your child has left behind their carrot sticks in favour of someone else’s chocolate bar. So the lunchbox must appeal to them as a child as well as satisfy their nutritional needs. The main component of a lunchbox does not necessarily have to be a sandwich. There are plenty of other options you can make instead, if you know that sandwiches are not likely to inspire your child to eat their lovingly prepared lunch. If you do decide to go down the sandwich route, then shy away from processed white bread. Try wholemeal bread instead – if you buy good quality it will be a lot tastier as white and you may find your child actually starts to request it. 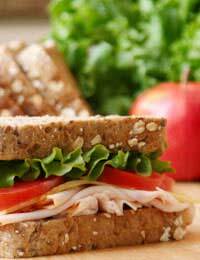 Make sure the fillings are tasty as well as healthy – no child is going to stomach a sandwich of cheap ham every day. If you are using cheese, add some cucumber. If you make tuna sandwiches, mix it with sweetcorn. And make them a little different every day so your child does not get bored. If you think they would prefer something more adventurous than a sandwich then make them a pasta salad, or couscous. Pop it in a little tub and make sure they have a fork to eat it with. Crudites are a great way of adding some vegetables to their packed lunch. Carrot, cucumber or pepper sticks can all be munched on in lieu of biscuits or chocolate. You can even send them with a dip of some description to liven up the packed lunch even more. Remember though, that a little of everything is ok in moderation, so treat them to a chocolate bar on a Friday, or a couple of chocolate biscuits once or twice a week. But make these in addition to the snacks, not instead of. Always add some fruit; as well as making a nice dessert, the fruit will give them energy for the afternoon ahead. Water is by far the best drink you can put in a lunchbox. If it is chilled when you add it, it will turn the lunchbox cold too and act as a mini ice pack. If there is absolutely no way your child will drink water, then juice is the next bets option, but this should not be encouraged because of the natural sugars present which can damage their teeth. Fizzy drinks should never be included – as well as being unhealthy in many different ways, they will give your child a sugar rush and they will not be able to concentrate in the afternoon. Creating a healthy – and imaginative – lunchbox takes a little time and effort. It may not be as easy as giving your child a couple of pounds every day or even making a batch of boring sandwiches at the beginning of the week but it will ensure that your child enjoys a balanced diet even when they are away from you at school.